With all the talk of stimulus plans for the economy, and of universal health coverage in this United States of America, I wonder why we don’t remember the lesson of the truck. I’ve heard this story from a number of self-help teachers. The truck was a semi-trailer filled tall with some cargo. Going under an overpass, the cargo was so high that truck got stuck. It was wedged under the bridge. With a gaggle of men wondering how to untie and unload the vast cargo, it was suggested to take some air out of the tires. That would create enough space to get the vehicle moving forward again. What a simple solution. Instead of continuing to pile our health care cargo high with evermore expensive procedures, why not work on the more basic pieces first? Then we won’t have to expend as much. In other words, learning how to take care of ourselves with natural movement methods is a medicine almost free. As a medicine, gentle movement brings many cures. Not everything can be addressed with easy movements, deepening breaths, and mind-quietening procedures. But much can. In an article in the Wall Street Journal by four famous healers (Deepak Chopra, Andrew Weil, Dean Ornish, and Rustum Roy) they claim that 2.1 trillion dollars was spend on healthcare in the previous year. But most of it wasn’t health care. It was disease care, money spent after the fact on preventable diseases. The Wall Street Journal article goes on to extol the powers of “simple, low-tech, and low-cost interventions” in health care. If there is something simpler, lower-tech, and lower-cost than basic Qigong, I would like to know about it. Here is an idea. Instead of spending a trillion dollars on medical care, why not allocate a billion dollars to promulgating natural principles of health. (That still leaves a trillion dollars for the doctors, drug, companies, machine-builders, and hospitals.) Millions of people are already taking classes in Yoga, Taiji (tai chi), Qigong (chi kung), pilates and other body-centered health-empowerment methods. How about a couple of hundred of million of people. We as a nation would save trillions of dollars. Each person could save thousands; and more importantly, we could prevent or subdue much suffering. In the New York Times of Sept 27, 2012 is an article stating that insurance costs in the U.S. have essentially doubled in just 10 years. The average annual premious for a family has gone from $7061 to $15, 073. With more and people out of work or in lower paying jobs, and with a shrinking middle class, how can employers or families continue to pay these kinds of costs? High medical costs have broken the back of many individuals and families, and may yet break the back of the country. Qigong may become more than just a good thing to do for one’s health. It might become one of the only healthcare options affordable for tens of millions of Americans. Qigong is one of the most inexpensive methods there is to regain and maintain health—an important consideration in these uncertain financial times. While modern medicine continues it’s precipitous ascent in costs, Qigong still offers its wonders at bargain prices. Here is an article at MSNBC that says that medical care in the United States now costs an average of $8000 a year for every man, woman and child in the country. That is a lot of money. Training in Qigong is a so much cheaper. $8000 could get you 5 or 10 years of high-level, health-building instruction from a good teacher. And that training will probably prevent many pernicious health problems. I say that, instead of spending ever more money on drugs, surgery, and technology, let’s scale back. Let’s use such tools when really needed. 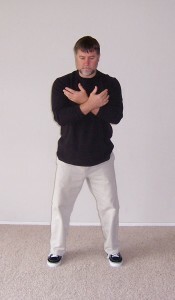 But let’s first do the such simple practices as Qigong exercises. These kind of practices not only don’t cost much, they save lots of money down the line. Qigong training is more than just a good deal financially, it is also one of the most effective methods of healings available. Qigong is said to be the most ancient health method of Chinese Medicine, and the foundation for all other methods. It has been used for thousands of years as a path to health and wellness. Practicing Qigong will not eliminate the need for every medical procedure a person may need to undergo in their life, but it can allay the need for many or most of them. Each person who practices Qigong benefits, and the society as a whole does too. With the nation’s medical expenditures nearing 20 percent of the gross national product, we need Qigong. Our economy depends upon it. The essence to having a life-altering, health-supporting practice can be condensed into three words. These three words are reminders of the first three principles of Qigong. By utilizing these three principles, you can gain continuous benefits to your health and well-being. “Practice” stands for having a daily practice of Qigong. If you practice, you reap rewards and build a great habit. If you don’t practice, there are no results. Missing practicing leads to forgoing Qigong altogether. “Modify” stands for slightly altering any move if you find it too strenuous or difficult to do. If it hurts, back off from it, make it smaller, or change how you do it. If you don’t modify a problematic move, you perpetuate tension. By modifying a move to be within your safe limits, you stay relaxed and gain benefits. “Refine” means you develop skill with the movements over time. You don’t just do the movements, but you massage them and bring more awareness of them. By refining, you create an upward cycle of improvement. You gain more and more from what you are doing. When I smashed my toe (see the post on it), I was trying to pay attention to too many things at once. I was on the headset telephone with someone helping me with a computer issue when I heard a car come into the driveway. I went to the window while talking on the telephone. I had to carry the little phone cartridge in my hand, as it was wired to the headset. My mind was still partly on the page up on the computer. Out the window I saw it was my wife. I somehow got the notion I needed to greet her at the door to let her know I was on the phone. So my attention was pulled five ways: to the person on the telephone, to my computer screen, to the phone cartridge in my hand, to the window, and to the front door downstairs. My brain waves were being stretched like mental taffy. One more piece of the puzzle contributed to my little accident. The tower of a radiating oil heater leans. The heater sits on four, plastic wheels-cheap things, really. Two of the wheels have become crunched in their bases, which makes them shorter. These two wheels are on the same side, long-ways, making the heater lean on that side. When I walked past the heater on the way out of my office, I bumped it with my leg. A leaning tower doesn’t take much impetus to begin leaning faster. And faster and faster. I was walking in the direction it was plunging. The phone cartridge was in my right hand. In the second or two it took the heater to gain horizontality, I tried to both catch the radiator with my left hand and step out of the way with my left foot. I almost caught it, but the weight slipped out of my hand. I almost slid my foot clear too. With my attention so divided, I didn’t quite get free of the crash shadow. Here was another lesson for me on staying focused. In Qigong, we learn that it is best to be in the moment. Multi-tasking is just a way to escape the power of focus, and it is dangerous. Recently I had a small accident. It wasn’t a great tragedy, as accidents go, but I didn’t like it. I managed to tip a heavy space heater onto my big toe. 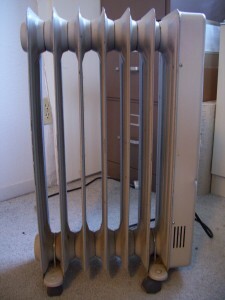 The space heater looks like a modern apartment building, tall and skinny. 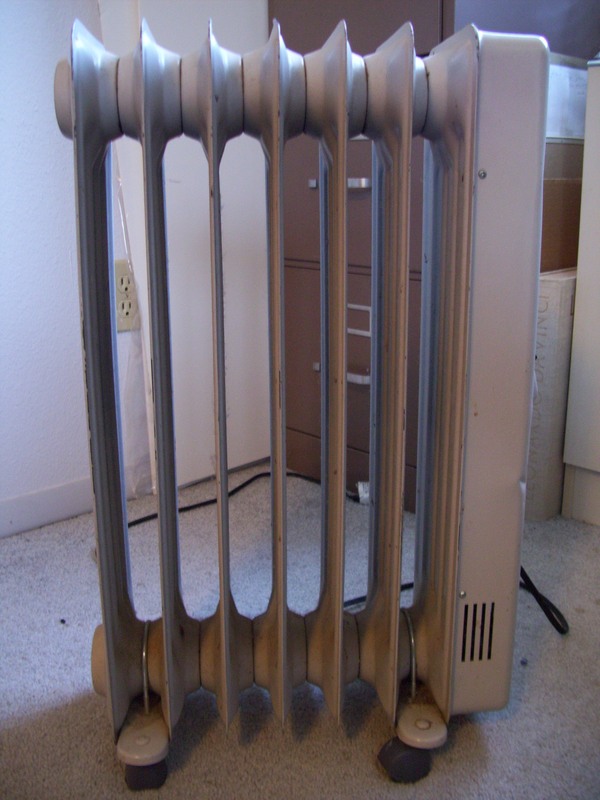 This metal radiator is just short of 2 feet tall and is 14 inches wide. It weighs close to 30 pounds and has a “steel fin design.” I learned about those steel fins. The edge of one of the fins hit right on the big knuckle of my left great toe. I received a half-inch long cut right over that knuckle. This cut came without the thick cotton sock even being ripped. I proceeded to do the usual jumping up and down one does after getting a toe squashed. I feared it was broken, but it was not; just badly abused by the smash. (By the way, you can tell if a bone is broken by placing the single end of a vibrating tuning fork on the bone. If you scream, its broken.) That evening I could only hobble, using just part of my foot to walk. My toe didn’t want any pressure on it at all. I iced it, as is good to do with an acute injury: It brings the swelling down. I then rubbed some arnica salve on it, which I think helped ease it some. Though I knew my toe wasn’t broken, I was concerned that it might take a month or two to heal, based on how tender it was. The next morning I had my weekly Qigong and Tai chi practice with my training partner Bob Shapiro. I knew I wasn’t up to our regular level of activity. We usually practice both standing-in-place exercises and forms that move over a lot of floor space. I could do none of that with an almost-broken, thoroughly sad toe joint. I was still hobbling, able to put no pressure on the toe. I stutter-stepped to the practice space, putting all the weight on my left leg onto the heel and outer foot. As you can see by the exercises, I did very little work directly on the leg. One of the principles of healing is that the body is all one unit. Helping the functioning of the Liver or the Lungs or the lymph, makes the whole body work better. There is then room enough for the body to go about healing at a greater pace. By practicing Qigong that got me relaxed, recharged and rebalanced, my whole body was better. I had feelings of pleasant fullness, warm hands, an easy and deep breathing, and a quiet mind. I know of these types of effects happening from healing. As a professional, pondering healer I make it a practice of telling my clients about such principles. I say that healing one part of the body will help the whole heal better. Likewise, healing the greater whole will help an particular area in need. Yet I am still surprised sometimes. Surprised? I was astounded! Within a couple hours after the Qigong practice with Bob, my toe was incredibly better. I had expected a long, low-altitude arc of healing. Instead there was this steep rise. My toe felt maybe 50% more at ease. I could walk on it some. Within three more days I was able to work outside, chopping and transporting firewood. Only a small amount of tenderness remained. Interestingly, there was no bruise when the toe was in the most pain, early on. By day four or five, a great yellow and plum bruise of about 2 inches in circumference had arisen. Notice how you breathe when you are typing. Years ago, when I was first struggling with the confounding intricacies of computers (mostly with learning MS Word), I noticed I tended to stop breathing at the keyboard. This got me tense and frustrated and tired. I resolved to consciously breathe when working at the computer. I began to remind myself over and over and over to breathe. I would say, “I breathe when I type, I breathe when I think, I breathe when I write.” It took me two years to build the habit where I did breathe well at the keyboard. I still must remind myself now and then. Good breathing takes a conscious effort, an involvement of awareness and a desire. These days, I’m lot happier on the keyboard and I get my breath practice at the same time as I type. There is no reason not to breathe while looking at a computer screen. Just utilize a small portion of your awareness toward keeping your breath deep, easy, full, slow, and constant. You will have more energy, be more relaxed, and heal all kinds of little ills. You will feel better. Qigong is about being natural and moderate. Stop a practice if it creates unpleasant symptoms such as dizziness, in which case you might have been breathing out of balance, or trying too hard. Come back to your practice later after you settle down. 1. If there is chaos in the environment. Chaos around you will agitate your Qi, not settle it. Examples of such chaos include: stormy weather; too much noise; a busy street nearby; or weather that is too cold, wet, or hot. Instead, wait out the chaos. 2. If you are especially tired or sleepy. Get some rest or sleep. Practice Qigong later. 3. If you can’t stop thinking. Thinking too much deranges the energy flow in the body and tends to keep too much energy in your head. 4. If you are too serious in demeanor or have too reverential an approach. Be sincere, but keep it light, not emotionally heavy. 5. If you are excessively hungry or too full of food. If hungry, eat. If full, let it digest for an hour or two. 7. If you are sick. Prioritize rest and sleep. A little bit of light Qigong done in short pieces throughout the day seems to decrease the duration of an illness. 9. If you are Menstruating. Most teachers recommend practicing more lightly during menses. Store Qi on your Kidneys, not in your Dantian. Charging the Kidneys is one exercise that you can use for this. 10. If you are Pregnant. Your body is going through so many changes. I don’t recommend beginning Qigong for the first time after getting pregnant. It is probably a good idea to continue a Qigong practice if you already have one, but be mindful and extra gentle with yourself. Especially at this time of life you need to aware and in tune with your body. If you begin to feel nauseated or out of sorts, stop the practice. Avoid storing energy in the lower energy center though. Put it into the Kidneys. Do not do healing sounds when pregnant so as not to vibrate the womb. I don’t know how healthy banks are in these days of fiscal repression or pre-depression or whatever is happening with the stormy weathers of the financial oceans; nor what monetary, medical or livelihood issues may loom for regular folks out there. I do know that practicing Qigong is free. You might pay for lessons or study materials, maybe spend a little for travel to a class. But that isn’t much. And your practice at home is free. It costs nothing and will save you money in health costs. It is like money in the bank (a solvent one.) It is a personal health savings account and an investment in your future. Your personal health savings account acquired from Qigong practice (this currency is sometimes called Qi) can’t be sold to third party lenders, or redistributed to chancy schemes with memes that are as evanescent as fog. Ponzi scams masquerading as investment advice cannot steal the interest gathered from Qigong practice. Getting your Qigong in daily is one way you “pay yourself first”, which is the old principle of personal savings. Except with Qigong, your coin is in not monetary or real estate assets, but in the richness of feeling good in your body, mind and soul. You can walk down to the park and have yourself a prosperous time breathing in and out the fresh air, while gently moving your body. This is a genuine, natural opulence that you get to luxuriate in. This is the good life. The half-half rule is this: On days that you don’t feel up to practicing your Qigong, do half as much as you usually would, with half the focus or intensity. In other words, practice, but be lenient with yourself. By getting some practice in, you have kept the momentum going, and it will be easier to practice the next day. Skip the practice entirely, and it will probably be more difficult to get into subsequent days’ practices. Add up enough of these skips, and soon you’ve skipped town completely on your Qigong. Don’t get me wrong, quality of practice is important. Doing it at all is more important. The first principle of Qigong is regular practice. It might seem obvious that you need to practice, but I have found that practicing regularly is a rock in the path of health that most people stumble over. There is something about getting into a Qigong practice and sticking with it that most North Americanos seem to have difficulties with. I have heard from hundreds of people about this issue of not being able to keep up their practice. Maybe it is because everyone is so busy that one more activity seems overwhelming. Let me assure you that Qigong is worth the little extra time it takes, it is money in your healthiness bank. I have also heard from scores of people that once they re-began a practice after laying it aside for a while, they instantly noticed the difference in how they felt. By starting, stopping, then starting a regular practice again, the uptick in their energy levels and general health was obvious. I recall one lady who had had spinal fusion back surgery some years before. She told me that when she invested the time to practice 10 minutes of an exercise called Swimming Dragon each morning, her back didn’t hurt that day. If she skipped her Swimming Dragon session, her back hurt.